Onkyo launches Dolby Atmos amplifiers and speaker packages | What Hi-Fi? Dolby Atmos is coming to your home cinema, with the news that upcoming Onkyo AV receivers, home cinema systems and speaker packages will support the "next-generation audio format". The new TX-NR1030 and TX-NR3030 AV receivers, flagship PR-SC5530 network AV controller, HT-S7705 and HT-S9705THX home cinema in a box systems, and SKS-HT678 and SKH-410 speaker packages will all offer Dolby Atmos sound. The company will also release a firmware update, due in September, enabling Dolby Atmos on its midrange TX-NR636, TX-NR737 and TX-NR838 network AV amps. Dolby Atmos has so far been limited to specialist cinemas but the sound format is now coming to AV kit, with Onkyo first to market with Atmos amps and speakers, soon to be followed by Pioneer and Denon. Onkyo says Dual 32-bit DSP Engines will "decode, scale and calibrate Dolby Atmos to suit individual home theatre configurations". Users will need to add a pair or more of in-ceiling height speakers to an existing surround sound system (5.1, 7.1 or 9.1, according to Dolby) to enjoy the Atmos effect or add Dolby Atmos-enabled speakers to their set-up. 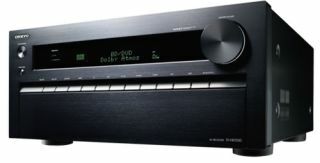 The top three Onkyo AV models – the TX-NR1030 and TX-NR3030 AV amps, and PR-SC5530 network controller – will deliver up to 11 channels of amplification. Elsewhere on the flagship AV amps are eight HDMI inputs and three outputs, support for 4K/60 Hz video, 1080p and 4K upscaling, ISF calibration, high-res audio support and more. There's built-in wi-fi, with support for DSD and 192/24 FLAC and WAV files, and Bluetooth. MORE: Dolby Atmos: What is it and how can you get it?